Are your searching for the best vision bird cages for your loving birds? Then this is the perfect place for your loving pet to select the perfect comfortable, reliable and hygienic cage for your birds. You need the best vision cages for bird which will give your bird maximum facility, premium security, perfect flying zone and all the features included that are your birds need most. Trying to find out a reliable brand name for parakeet’s cage, then you should go with bird cage of vision series. Because It fulfills all the requirement your little flying pet need in their tiny life. To have bird like parakeets as a pet, lot of owner face difficulties when it comes to the point of selecting ideal cage for them. As you know in wild life bird fly upon the sky as the world their home. So before considering to buy a cage for parakeets, think of something that you can afford most probably. 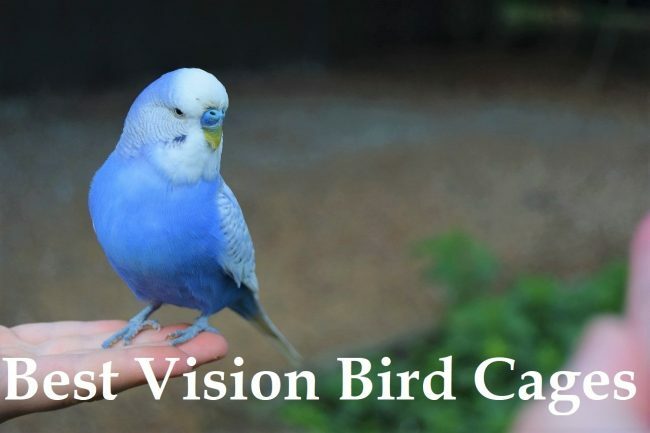 Researching all the pros and cons we find out vision has the unique and essential features you might want to put your pet bird. Not only for parakeet they have different size and model according to their customer choice that also perfect for small bird like cockatiel, finch, canaries. One of the best Vison bird cages are the most popular cages on the market for pet specially birds such parakeets or budgie’s, finch, lovebird and canaries. Birds are needed to be kept in comfortable safe, hygienic and flying facility cage. Most of the pet lover is familiar with Vision cages. They have designed multiple size cages for different size birds in this article we are reviewing for the small birds parakeets, canaries, lovebird, finches. Vision M02 medium size cage dimension 24.6 inches long x15.6 inches wide x 34.3 inches high and tall enough perfect for small birds aviary. This cage is so special for smart construction debris guard which helps keep the waste inside the cage keeps the cage clean. M02 has deep base designed keeps the waste hide, you can set the perches for the bird from outside those perches are safe for bird foots as included in that cage. The door is very flexible can access multiple ways, double compartment cup can have enough meal for your lovely birds. M02 is tall enough for your birds flight maximum cage is not tall perfectly as Vision bird is. The set up of the cage is too easy just connect the clips can be set within in a minute the setting technology of the cage called snap fit assembly which is awesome saving your time and energy. The maintenance of the cage easy first remove the upper frame and clean the base. The base can handle much waste than any normal cage on the market. The wire spacing of the cage is accurate for your bird health. It the wire spacing is not perfect air flow and the dust from the bird such features will not pass from the cage which is needed the most Vision keeps that in mind before build the cage. The finishing of the cage is wonderful perfectly polished with non-toxic coating safe for your bird health. Sometimes bird do exercise with cage wire by their beak if the coating is non-toxic it can be great harmful for their health. Wire joint finishing also exactly done on the cage some pure cage has not perfect finishing which caused bird injury. This cage is greatly portable handle you can take it easily wherever you need nice griping with two hands for transportation. Why you choose medium size cage? If you are confused buying one or two birds or you have possibility add one extra bird then medium size is the exact choice. If we talk about color of the cage smart, classy and exclusive view. The tall space will give your birds some space to fly which is needed most for the birds keeping good health. Birds need to use the energy to expense on flying or doing some exercise they harvest from the food it is one of the basic need of bird that means fly zone if your cage has some flying space it is very good for their health. Vison S01 is one of the best choice for small bird lover who has small space and the quantity of the birds are not much. The dimension of this cage 15 x 19 x 20 in perfect for small birds parakeet, finch, canaries, lovebird. The height of this cage is not much longer than medium cage its single height cage. Medium M02 height is the taller of Vision cages. The goal of Vision cage S01 model for two reason first it is a low budget high quality cage by the famous brand with great quality cage anyone can buy the cage anytime for the low budget students, hobbyist favorite to them and the second reason for the popularity of that cage it requires small space to fit saves space on your room where you set the cage. Vision Model S01 is perfect for small birds only if you put large birds it will not comfortable place for them but for small birds enough space to live with great comfortably. This cage is equipped like our previous recommended model M02 with green perches, food or water dishes. The settings of that cage also easy like all the vision cage you can set it up within one minute connecting the clips. The wire spacing is perfect enough for ventilation. For the debris guard the waste remains inside and can cover more waste than other cages on the market its one of the specialties of Vision cages having deep base design. S01 allows easy access having flexible double door for in or out you can place your bird easily and place to another cage while cleaning the cage also easily for the flexible cage door. Vision determination is to build some bird cages to provide great comfortably hygienic living place live like real home to bird. S01 is portable cage light in weight you can move it out easily where you want to place this model cage fits anywhere in your home taking small space. Hagen Vision medium size bird cage is good for small bird finch, parakeet, cockatiel, canneries, lovebird. The height of this model is single height and the width of this cage is broad the dimension is 24″ x 15″ x 20 1/2″. Like other Vision cages, it has green perches, water or food dishes. The spacing wire of that is small but excellent for air flow no problem at all. Hagen bird cage is one of the best cage for small bird good choice for bird lover. You can set the cage within a minute no extra tools required for the setting of the cage just plug and play type cage you will get all the necessary clip and the green perches with the cage. The perches of the cage is called green perches because it designed so that the bird cage could not get any harm they will feel comfortable with those perches like they sit on the trees although we can not give them that environment on the cage but we have to try our best as we can. Vision cage always tries to give maximum comfort and facility to the birds their research and development is good enough so that reason people have great faith to them. Not only for bird cages people have faith to Vision on other pet cages for the great comfort with nice construction and space. This model of the best Vision cages, is special designed for Canaries constructed wide range Canaries birds need width space for flying zone. The dimension of that cage 17 inches long x 31 inches wide x 22 inches high perfect enough for small birds this model is not only for Canaries you can use for parakeets, lovebirds, finches and cockatiels also. Deep base design can consume more waste which is an exclusive feature of all Vision cages. Debris guard consumes the waste inside the cage to clean remove the upper wire frame and clean the base it can be done within few minutes the maintenance of the cage is easy requires low time. This model is larger version of best vision cages, it stands double height that perfect for two or three parakeets and a couple of cockatiels. As well you can put finch, canaries very easily in this cage space, because the wire space is perfect for little size bird. And the unit comes with terracotta food dish and water bottle so no hassle of buying extra equipment for the cage. Just set and decorate with toys and stuff, then introduce your bird to its new home. The double door access to reach out and communicate with your bird. Its a healthy habit to talk a while with your pet bird through this they learn to bond and create a relationship with owner. Vision made this very easy for pet lover all equipment in single place. It also easy to clean and bird friendly design. Trying to set the cage in a suitable place, vision did the job easy for you. They come with cage stand which is perfect for all kind of medium size of vision bird. The measurement of the stand is 13 by 22 by 30.8 inches and pretty lightweight 17.6 pounds, its perfect to hold the whole body of cage strongly. The structure is pretty nice with four leg and one shelf to keep birds stuff like food, medicine, extra toys and so easy to set up with Allen keys. The cage stand is durable and heavy duty material. Vision know what your lovely bird need in their little cage, thats why it brings colorful and gorgeous bathing box to cool down your bird and rinse off instantly. It fits medium size cage frequently and i am definitely sure bird love to bath badly. It has upper part so that can clean and plug again. Do not think seeing the bath tub they jump and start to enjoy, be patience it takes time to cope with new things. So do not worry if they don’t like it at first day, hang it there after a while they will love it. Birds need privacy in hatching period that time birds go on through great stress sometimes their attitude looks like abnormal. We have to understand that they only concentrate how could the eggs go to hatch out with cute babies. One day their dedication comes true with small cute babies. When birds on hatching they do not take meal perfectly they hatch the eggs very carefully. So that they need a perfect zone for hatch their eggs if your bird has a beautiful decorated breeding zone it will be great for them. You can made breeding zone for your loving birds but it requires some components which collection is too panic in exchange that if you expense a little bit money you will get a nice breeding box. Yes, thanks to Vision for making of such nice, beautiful and excellent construction of that type breeding box for your birds. They will get exact zone which they need the most. This breeding box is excellent for hatching eggs and the parents will get a little bit privacy to hatch and feed their babies coming out from eggs. After completion of hatching and baby grown up you can clean the breeding box and reuse while your bird needs. All the bird love has those breeding box for the hatching period you can check it out for your loving birds.